Office hours are Monday to Friday from 9:00 AM to 5:00 PM. In the middle of historic Vermont marble quarries sits the Carving Studio and Sculpture Center…where else would you go to learn how to carve stone? The facilities of the Carving Studio & Sculpture Center are ideal for the creation of three-dimensional artwork in diverse media. Our three buildings, on five and one-half acres of land, feature extensive indoor and outdoor workspace. Art studios for learning and creating hold classes comfortably and provide wonderful opportunities for focused work, whether in a group setting or as an independent artist. Workshop participants are provided with tools and materials required for their sessions. High capacity electric compressors, state of the art hand and power tools and heavy lifting equipment enhance the learning experience. Outdoor workstations are sheltered. 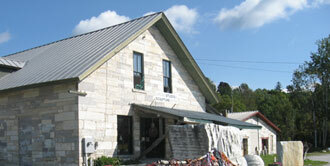 We offer a limited selection of stone and carving tools for resale to members and workshop participants. Our gallery is less than one-quarter of a mile from our operational center and features one and two-person exhibitions of fine contemporary art. Limited studio rental is available for independent study. The Carving Studio & Sculpture Center mission is to be an inspiration for three-dimensional artists and art lovers alike. Come see what’s happening at our art studios for learning and creating…we offer everything from stone carving classes to residencies that give artists space and time for their work. And in our gallery space you can see pieces reflecting a wide variety of styles and aesthetics. It’s a treasure trove of innovative contemporary art, tucked into a historic Vermont site. Turn left onto Airport Road and follow to Route 7 South. Follow Route 7 South into Rutland and take a right onto Business Route 4. Follow through downtown and into West Rutland (approximately three miles). Follow straight through until you reach a stop sign and flashing red light. Follow the road to the right (Marble Street) and you will find the Carving Studio and Sculpture Center on the right. Follow I-87 North (NY Thruway). Take exit 20 (disregard Exit 17 Rutland). Take a left off the ramp and then make a right onto NY 149 to Fort Anne follow east to US 4 East. Turn left on US Route 4 East. Take NY 149 East. Take exit #6. At the end of the ramp turn left. Turn left again at the traffic light. You will come to a flashing red light at West Rutland Town Hall. Bear right onto Marble Street. The Carving Studio and Sculpture Center is on the right, approximately ¼ mile after the railroad tracks. Take the NY Thruway (I-87) to Exit 24 Albany. Take Northway (I-87) north to Fort Anne/Rutland Exit 20 (disregard Exit 17 Rutland). Take a left off the ramp and then make a right onto NY 149 to Fort Anne- follow east to US Route 4. Turn left on US Route 4. Take exit 6. At the end of the ramp turn left. Turn left again at the traffic light. You will come to a flashing red light at West Rutland Town Hall. Bear right onto Marble Street. The Carving Studio and Sculpture Center is on the right, approximately ¼ mile after the railroad tracks. Take I-93 to just south of Concord, NH exit onto I-89 North and follow to US Route 4 Rutland, Exit 1 in Vermont. Take a left off ramp and follow US 4 West to Rutland. Take a left onto US Rte 7 and take the immediate right onto US Business Rte 4. Follow through downtown and into West Rutland (approximately three miles). Follow straight through until you reach a stop sign and flashing red light. Follow the road to the right (Marble Street) and you will find the Carving Studio and Sculpture Center on the right. Follow I-91 North to Bellows Falls, VT. Take Exit 6 (Rutland) onto VT 103 and follow until you merge right into US Route 7. Follow north. Turn left onto Route 4 West. Take the first exit, EXIT 6 (West Rutland/College of St Joseph). At the end of the ramp turn right. Turn left at the traffic light. You will come to a flashing red light at West Rutland Town Hall. Bear right onto Marble Street. The Carving Studio and Sculpture Center is on the right, approximately ¼ mile after the railroad tracks. Take feeder highways to NY Thruway (I-90). Exit at Albany onto Northway (I-87) follow north to Fort Anne Exit 20. Take a left off the ramp and then make a right onto NY 149 follow east to US 4. Turn left on US 4 east. Take exit 6 to West Rutland. At the end of the ramp turn left. Turn left again at the traffic light. You will come to a flashing red light at West Rutland Town Hall. Bear right onto Marble Street. The Carving Studio and Sculpture Center is on the right, approximately ¼ mile after the railroad tracks. Take feeder highways to NJ Turnpike. Exit onto Garden State Parkway and follow to NY Thruway (I-87). Take the NY Thruway (I-87) to Exit 24 Albany. Take Northway (I-87) north to Fort Anne/Rutland Exit 20 (disregard Exit 17 Rutland). Take a left off the ramp and then make a right onto NY 149 to Fort Anne follow east to US 4. Turn left on US 4 and follow east. Take Exit 6. At the end of the ramp turn left. Turn left again at the traffic light. You will come to a flashing red light at West Rutland Town Hall. Bear right onto Marble Street. The Carving Studio and Sculpture Center is on the right, approximately ¼ mile after the railroad tracks.